Normally the image at the top of the page is reserved for a specimen of note that we may have found. This time I felt it was a good time to show how challenging working Mt. Mica had become. This image shows several interesting features. The first is the extent of the overburden. Just over the boom of the excavator the schist was at least 35 feet thick. 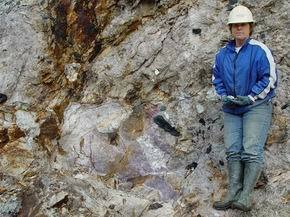 We had hoped, that as we worked up strike, the pegmatite may have shown some sympathy and risen closer to the surface. What we were seeing was that the pegmatite up strike, that gave the appearance of working closer to the surface, had simply thickened. This is evident on the left side of the image. 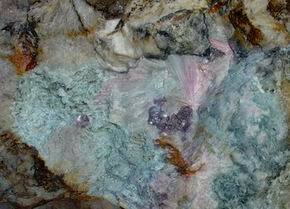 Though the pegmatite had thickened, the garnet line, and hence the pocket zone, was trending along the same dip and was now simply buried under more barren pegmatite. 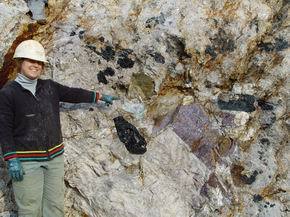 In the image one gets the impression that the pegmatite is plunging. In fact it has simply bulged. The pocket zone was still on the ruler straight 23 dip working inexorably lower into the ground. Since the beginning of our work in the main pit, we had been encouraged to bring in a track drill. This is a drill capable of drilling at a rapid rate and able to crawl on tracks to the location where the next hole was to be drilled. Smaller track drills can drill to a depth of approximately 16 feet. With larger units, 60 feet is obtainable. In a day's time considerable real estate can be drilled. Typically, once drilled, the mass of holes is loaded and then blasted. 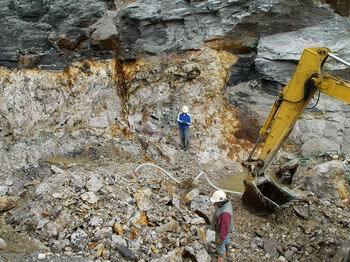 The drilling and blasting contractor then departs the scene of the massive rubble pile created and the miner is left with the task of removing the muck. Nothing is more depressing than a mammoth pile of fuming waste rock sitting on top of the pegmatite one is trying to reach. This is of course assuming that the drill operator has not under drilled the overburden ( drilled too deep) and some of the pegmatite has been fragmented along with the overburden. I witnessed one such operation in a local quarry that left a muck pile that took nearly two years to remove. Richard and I could easily drill a 10 feet deep hole with our pneumatic hammers. To extend our reach we acquired a 5 foot extension. This allowed us, with several drill steel changes, to drill 15 foot holes. Running both our hammers we found that in a half of day of this manual drilling we could create nearly a 3 days worth of muck pile removal. 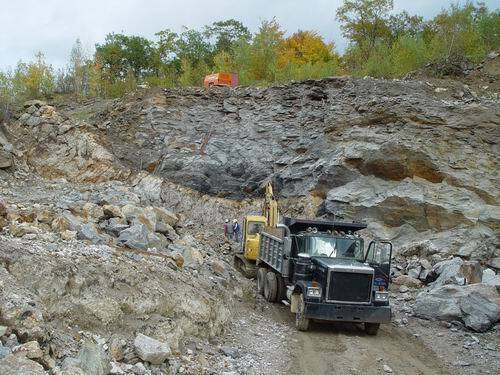 This cycle provided about 3 weeks of digging the pegmatite as we typically created a bench 10' wide by 35' long. As the schist thickened though we had to make two such passes to reach the peg. One more adjustment to our process was required as we worked these deep holes. Typically we drilled our holes on 4 foot centers. We discovered, the first time we shot the 15' deep holes, that there was a tendency for the first holes to fire to tear the top off of the adjacent holes along with it's noise suppressing stemming. This resulted in considerable air blast and a nasty-gram from one of our neighbors. Even though the weight of the explosive we detonated was well under the maximum allowable, the comprise to the stemming produced unacceptable noise. To avoid this in the future, we decreased our delay times and widen the hole spacing to 5 feet. With these modifications, even our largest shots were not louder than a muffled rumble. During August and September we were so tantalized by the rich pod of lepidolite and spodumene in the down dip face, we had decided to pause our progression up strike and take another slice off of the down dip face. This would allow us to work another 10 feet of this rich zone. Our hope was that we would encounter a significant pocket within or adjacent to it. Our hopes were not too high though, as experience had shown us that there had been extensive replacement and alteration associated with this enrichment. A pocket, if found, may just contain clay, the end product of some of these destructive processes. In the image Mary, in the blue jacket, is standing next to the lithia pod as it appeared in early October. This enrichment followed the sharp displacement in the pegmatite as we pursued it down dip. In fact, the garnet line followed the right hand contact and trended almost vertically in this area. This feature was probably responsible for the twin garnets lines we had seen earlier in the summer . Notice also the rusty fault plane to her left. This may be a sign of a significant pocket nearby. 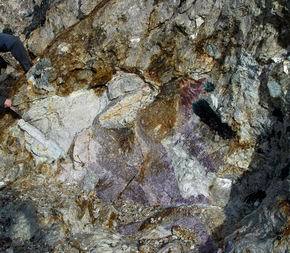 While working just up dip of lithium enriched zone, we blasted out a small vug that appeared void of tourmaline. Luckily,Richard noticed a small green section in the muck. After considerable time combing through the tons of rock blasted out, we were able to find most of the crystal. All of the pieces fit together so apparently there was only one crystal lodged in this tiny space. Although small, it's color is exceptional.